Debra Meehl, D.D. and Kristin Smith, L.C. 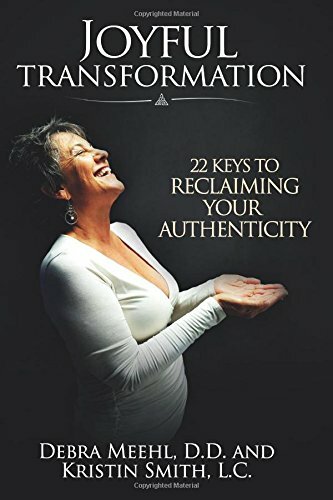 “Joyful Transformation: 22 Keys to Reclaiming Your Authenticity” is a self-help guide developed by authors Debra Meehl and Kristin Smith. It begins with Meehl’s personal crusade to preserve her marriage with a man suffering from bipolar disorder that eventually leads her to the field of Dialectical Behavior Therapy (DBT). Within this modality, the couple discovers that Distress Tolerance and Emotional Regulation are skills essential to reclaiming one’s authenticity in this chronic mental illness. Debra Meehl continues training in the field of DBT to help others achieve health through reconditioning habits of wellness. Along with her faith in God, she establishes her mission: to dissolve life’s negative patterns in order to reveal a genuine existence - one of truth and purpose. Meehl and her cohort Kristin Smith have assembled a publication that is filled with significant lessons. Their keys to joyful transformation are wonderfully organized. Each chapter begins with a description of a change to incorporate into your life - a new habit or way of thinking that can lead you to a healthier state of being. Topics run the gamut from mental awareness to nutrition to interpersonal relationships. Next, the authors offer an exercise to practice the concepts. And, finally, you are given other options to consider and journaling space to record your thoughts, observations or realizations. At the end of the text, Meehl and Smith send you on your way with a map for a life plan to achieve the goals you most desire. It is motivational to be given precise tools for generating change. This book is successful in presenting 22 ways to become a more joyful person. The authors’ methods are encouraging and the bite-size chapters are easy to digest. Although building on the concepts is the most effective way to experience their method, one can choose to skip around or focus on a single pathway for an extended period of time. I consider many of the key points to be informative but each concept has several options for you to explore so there is some value to be found in every chapter. The writing is smooth, clear and concise. There are a few grammatical errors but since it is a self-help manual, it doesn’t distract from the meaning of the content. The authors bring snippets of research, personal experiences and the words of countless other teachers and contributors together as an inspirational “carrot” to entice you to pursue their exercises for change. Each assignment always involves writing down your thoughts, wishes, and affirmations on paper. Debra Meehl and Kristin Smith have certainly done their research and it is evident that they have had extensive training in the fields of wellness and mental health. It is impressive how the authors can take a myriad of concepts and meld them so efficiently into one publication. “Joyful Transformation: 22 Keys to Reclaiming Your Authenticity” is truly a one-stop-shop for discovering a life worth living. Theirs is a guide to creating the existence we all deserve - free of obstacles, fears and distress. This book is for those who feel stuck or bound to a life that lacks luster or for anyone seeking to improve him or herself. “Joyful Transformation” can take you to new heights where you can reach a realm filled with positivity and purpose.